Broadcast Journalism is all news that you see or in other words that is broadcast on TV. So it is about collecting, packaging and presenting news on TV. 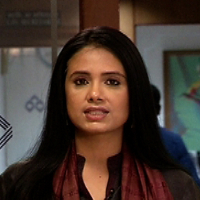 "After my education I worked at the broadcast station CNBC-TV18, a business channel for 15 years." Equity Research primarily means analyzing company's financials, perform ratio analysis, forecast the financials (financial modeling) and explore scenarios with an objective of making BUY/SELL stock investment recommendation. "I was born and brought up in Mumbai. After completing my education I started my career as a Equity Research Analyst in the company called Quest Securities. "